Join international dental sleep clinicians Drs. Terry Bennett, Chase Bennett and Mayoor Patel for three hands-on weekend sessions on the latest techniques in dental sleep medicine. 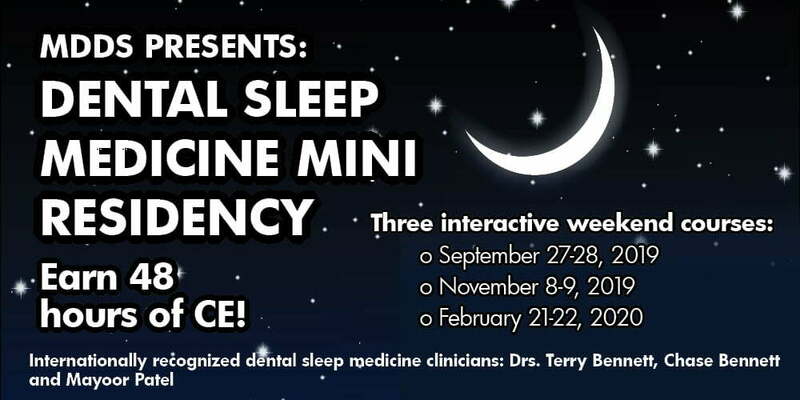 Gain the in-depth knowledge to confidently offer dental sleep services in your practice. * Fee covers all 3 weekend sessions. For payment plan options, call MDDS at (303) 488-9700. Cancellations will be accepted and are entitled to a refund provided they are received at MDDS by the cancellation deadline. Refunds will not be given for cancellations after the cancellation deadline. For your convenience, we have free parking in two retail garages within the Beauvallon building (east-facing side). Both garages are accessed from Lincoln Street between 9th and 10th Avenues. Parking in these garages is available on a first-come, first-served basis. **If you are attending a large course/event at the MWDI, we recommend arriving early in case the garages fill and alternative parking must be secured. Be aware – the garages come up quickly after you cross 9th Avenue and both have left lane entrances. All numbered spaces within both retail parking garages (without “Reserved” signs) are available on a first-come, first-served basis. Do not park in any spaces with a red sign that says “Matrix” or “KCNC.” Do not park in the residential parking. Residential garages are at the back of the retail garages. The north and south garages are not connected. Both have open parking available. See link for more information. MDDS has established special discounted rates at nearby hotels for attendees needing overnight accommodations. Note: Rates do not include taxes.